we are the area's Austin Solar Screens source. For a Solar Screens Austin TX supplier, no need to look further. 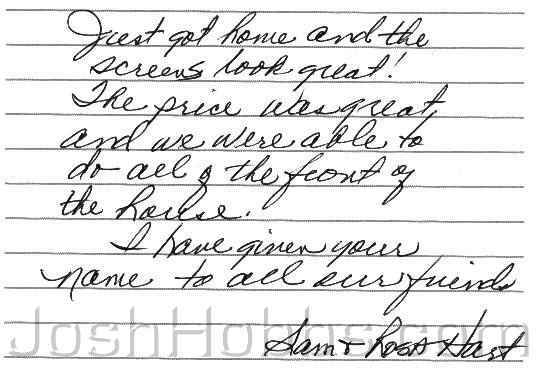 Our Solar Screen pricing is hard to beat. 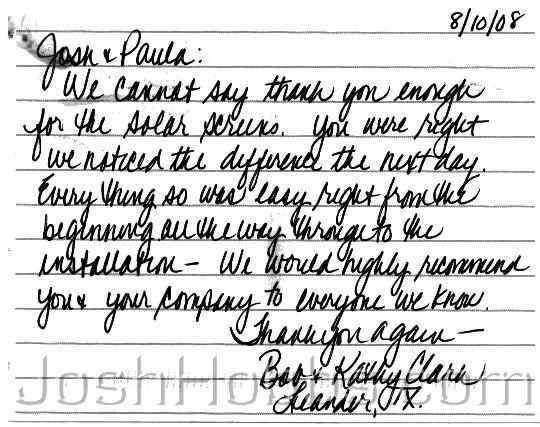 we are your go to people for Solar Screens Austin. Our Solar Window Screens are built to Last! As an Solar Screens Austin Texas supplier, we build our Austin Solar Screens to be the Strongest & Most Durable of all local vendors. Lowest Pricing for Solar Screens Austin TX ! we install Solar Window Screens for less! And, we are very good and efficient about it! 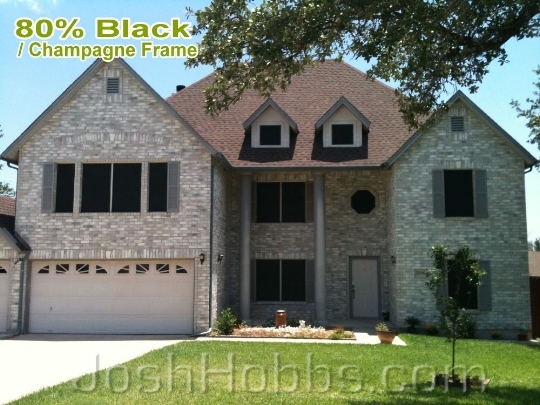 Please visit our www.joshhobbs.com Solar Screens Austin TX WebSite to get installed pricing and to learn about our services. like on a reddish brick with tan trim Austin TX home. The beige solar screen looks great against this kind of exterior. 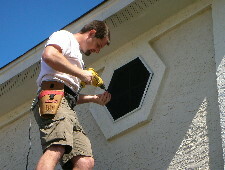 . . and methodical with our solar window screen installations . . we will do a great job for you ! We can build a Solar Screen for any size or shape of Window. If you live in the Austin Texas metro area, with our Solar Screens Austin Texas services, we can INEXPENSIVELY shade your home / house / business / commercial building with Solar Window Screens that WILL help to keep the inside of your property cooler to help you reduce your electric bills. Solar Screen for it ! This home has two 1/2 Circle windows (top left above garage and above entrance door), two hexagon windows, and six rectangular windows which we built solar screens for. We can build a solar screen for any window, any size, any shape or any form. If your home is in the Austin Texas area, and you have a glass window that you want covered with Austin Solar Screens to keep the heat of the sun out, we can build a solar screen for it to do just that. therefore your A/C will not have to work as hard. Our Solar Window Screens are Attractive! Solar Window Screens are not only good at shading your home's windows from the Sun, but they can be good-looking as well. With our five Suntex 80% and 90% Fabric options and our five Frame color options for you to choose from, you have twenty-five possible solar window screen color combinations for your Austin Texas home. Please be sure to take a look at our Solar Screen Pictures page on our website to see many examples of the different color combinations on the various types of homes. With our twenty-five color combinations, you can really enhance the beauty of your Austin Texas home ! This customer has a Beautiful home located in North Austin Texas that she wanted Solar Window Screens that would compliment her home's exterior and to shade her home's windows. Based on her exterior colors, we used our 80% Chocolate Solar Screen sun control fabric with Tan frame, which created a beautiful complimenting look. The house now looks just that much prettier. When choosing solar window screens, please strongly consider using a solar window screen for each of your home's windows. The appearance of your house will be enhanced considerably if you have a solar window screen installed on all of your windows. Our Solar Screen Sample Kit will provide you with samples of each of our Solar Screen Fabric and Frame colors. These samples are perfect to help you determining what Solar Window Screens color combination you want for your Austin Texas house. We can install Solar Screens on Doors of all kinds. the Sliding Door to slide behind. We can build a solar screen for all types of doors, whether they be sliding doors like illustrated here above or fixed doors with windows within them. On our website under our questions & answers page we a have a thorough section dedicated to explaining Solar Screens for Doors. This picture is of a solar screen sliding door we made using our 80% chocolate suntex sun control fabric using a steel metal brown frame and a fixed pocket door out of the same sun control fabric and frame. 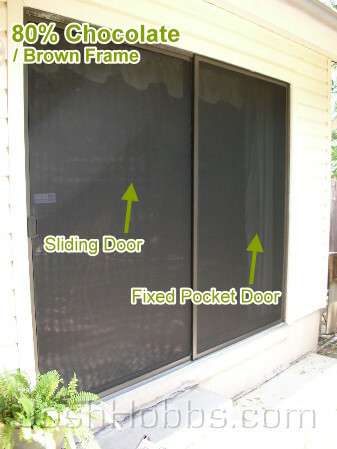 The sliding door slides behind the fixed pocket door when open, but when closed you have the shade protection from both the sliding door and the pocket door. Please be sure to visit our Solar Screen Austin Texas website for our installed pricing. 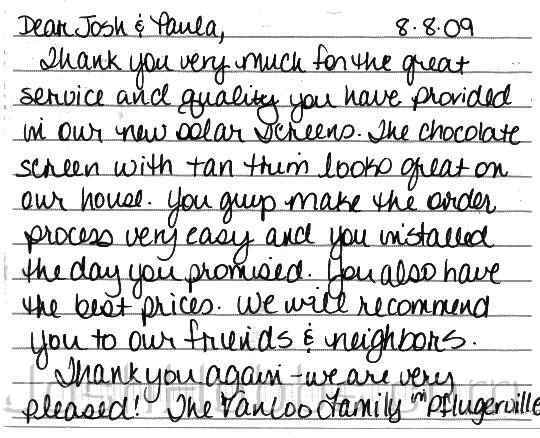 Josh & Paula, We can't say thank you enough for the shade screens aka Solar Screens Austin. You were right, we noticed the difference the next day. Everything was so easy right from the beginning all the way through to the installation. We would highly recommend you and your company to everyone we know. 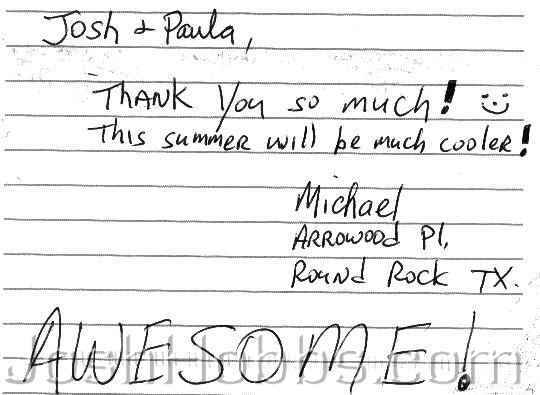 Josh & Paula, Thank you so much! This summer will be much cooler with our new Heat Shade Screens aka Solar Screens Austin TX AWESOME ! 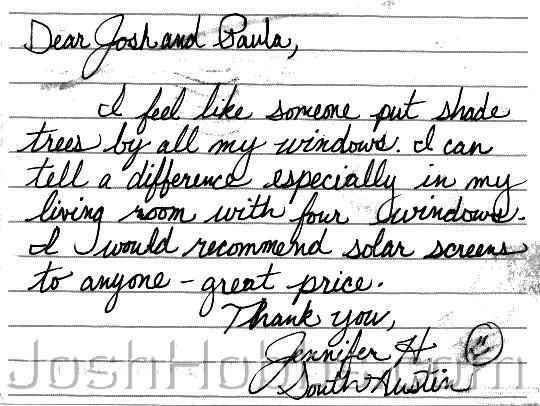 Josh & Paula, We are so happy that our home now wears your Window Shade Screens aka Solar Screens Austin Texas. I wish I had done this a year ago when we limped through another really hot summer. 2) Effect -We really feel the difference, as we stand next to sun drenched windows, there is no radiated heat. 3) Professionalism - Your thoroughness, timeliness and exacting detail to all you do is rarely found. 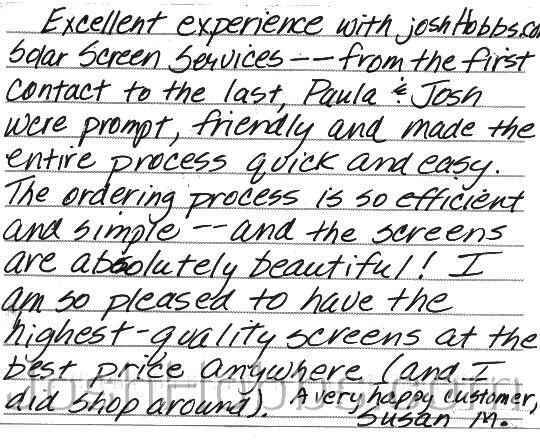 Josh, Thank you for excellent service and A+ Quality for a Product (Glass Shade Screen aka Solar Window Screen) at a fair price ! Wow, very nice !! Great job, Thanks. Solar Shades aka Austin Solar screens are great and secured very well. House is much cooler now. 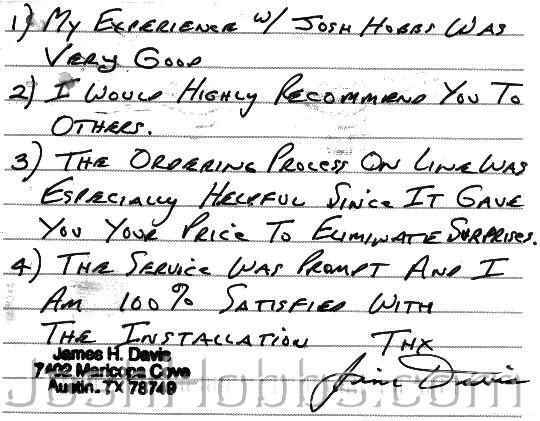 Excellent experience with JoshHobbs.com Solar Screen Services - - from the first contact to the last, Paula & Josh were prompt, friendly and made the entire process quick and easy. The ordering process is so efficient and simple - - and the Solar Window Blinds aka Solar Screens are absolutely beautiful ! 1) My experience w/ Josh Hobbs was very good. 2) I would highly recommend you to others. 3) The ordering process on line was especially helpful since it gave you your price to eliminate surprises. 4) The Window Sun Shade Screens aka Solar Screens Austin TX service was prompt and I am 100% satisfied with the installation. 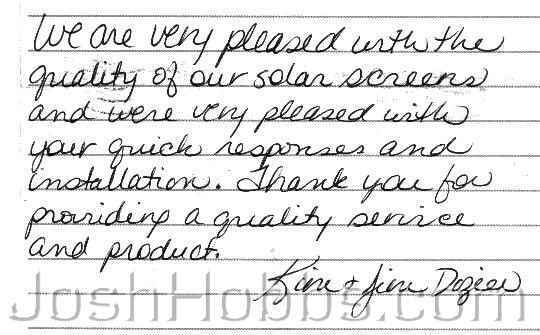 Read more reviews about our solar screen services here . . .
re: 66 Austin, TX - We are enjoying the window shades. My home office is cooler in the afternoon. re: 64 Round Rock, TX - Just got home and the Sun Screens look great ! 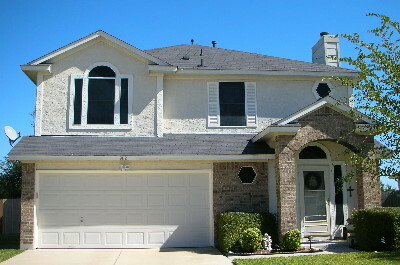 re: 71 Pflugerville, TX - The chocolate sun shade screen with the tan trim looks great on our house. re: 72 Leander, TX - Josh & Paula, We can't say thank you enough for the shade screens. re: 74 Round Rock, TX - This summer will be much cooler with our new Heat Shade Screens. re: 75 Austin, TX - I feel like someone put sun shade trees by all my windows. 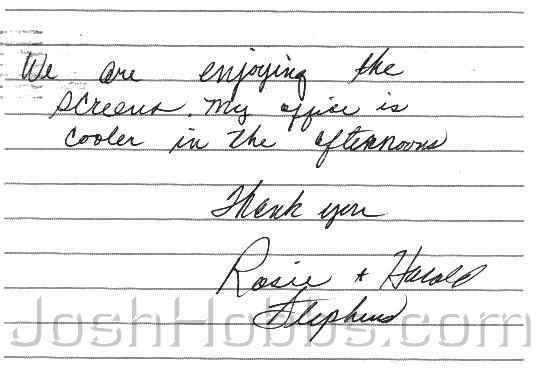 re: 79 Austin, TX - Josh & Paula, We are so happy that our home now wears your Window Shade Screens. 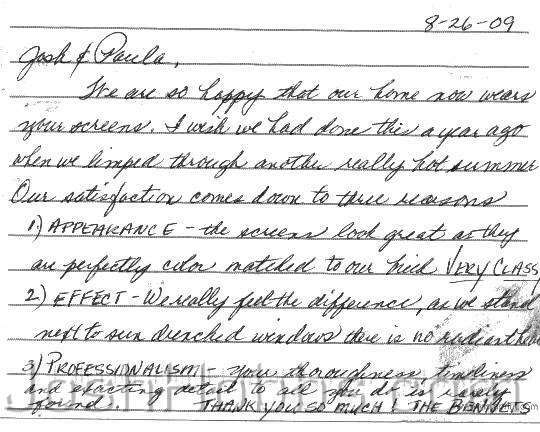 re: 80 Lakeway, TX - Thank you for excellent service and A+ Quality for a Product. re: 81 Buda, TX - Solar Shades are great and secured very well. House is much cooler now. 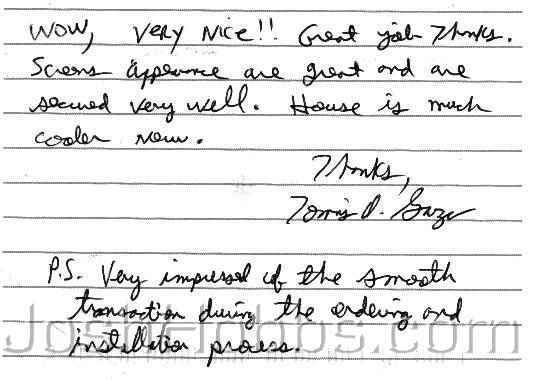 re: 82 Manor, TX - You were friendly and upbeat. You made it an enjoyable experience. 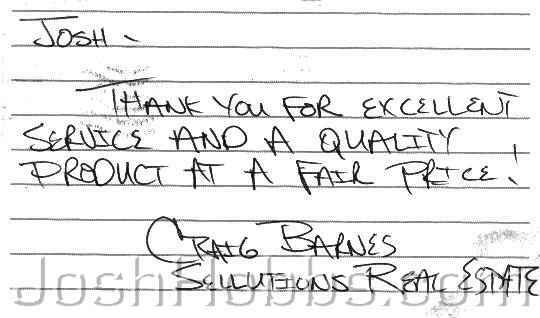 re: 84 Pflugerville, TX - Thank you for a providing a quality services and product. 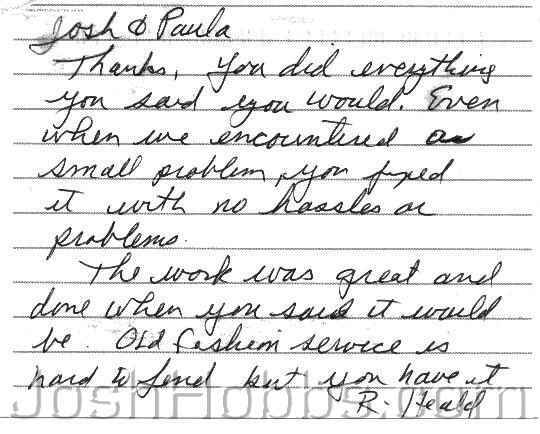 re: 85 Leander, TX - Old fashion services is hard to find, but you have it. re: 86 Austin, TX - I would highly recommend you to others. 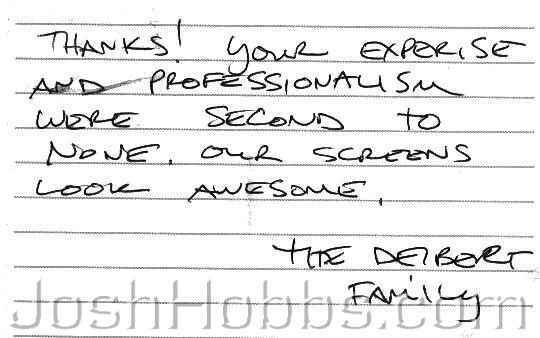 re: 87 Pflugerville, TX - Your expertise and professionalism were second to none.